Welcome to Riverside Centre Antique Mall! One of Cincinnati’s Best Kept Secrets! 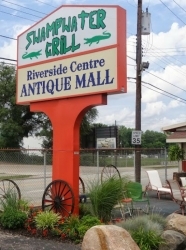 The Riverside Centre Antique Mall & Resale Center carries over 30,000 square feet of antiques and collectibles. You can find anything from antique and re-purposed furniture to fine art and oil paintings. Our ever changing inventory offers a wonderful selection of oddity and novelty memorabilia, along with vintage toys and military items. If you are a movie buff and Hollywood icons are your thing ... then come check out the selection of movie posters and collectibles that our vendors have to offer. Both serious collectors and weekend browsers can get lost in the experience of perusing our vast inventory. New merchandise arrives daily, so every trip is a new adventure! Be sure to sign up for our newsletter at the top of the page under the calendar. Enter your email address and receive invites and updates about our special upcoming events. There is just about something for everybody at the Riverside Centre Antique Mall and Resale Centre so don't miss out! Call us at 513-321-1430 for more information or visit our location at 3742 Kellogg Avenue, Cincinnati, OH 45226. Stop by and check out what is "old made new again" at the Riverside Centre Antique Mall and Re-sale Centre!